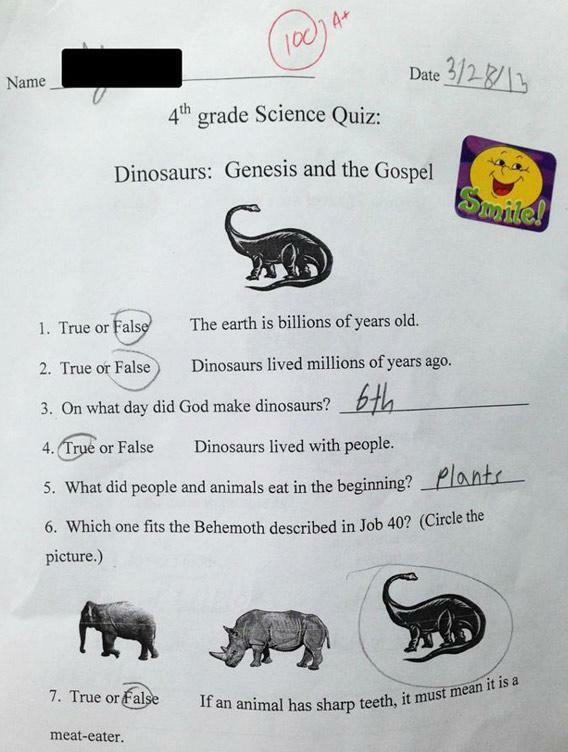 Creationism in school: Science quiz gets it totally wrong. This came out a while back, but I wanted to see if it could be verified before writing about it. Via Elise Andrew at “I F’ing Love Science” on Facebook, I see it has in fact been verified. According to Snopes.com, this is the first page of an actual “science” quiz given to fourth graders at a school in South Carolina. I suspect, if I were a student at this school, I would have gotten a 0 on this quiz. Once you’ve stopped screaming in rage and/or pounding your head against the desk, let’s discuss this. To start with, this photo is real, and was part of a quiz given at Blue Ridge Christian Academy, a private religious school. Since the school is private, and not public, this is not a violation of the First Amendment (unlike the flagrant stomping of the Constitution going on in Louisiana). In other words, this school can legally teach this. My complaint, therefore, is not a legal one. My complaint is one of simple reality. Young-Earth creationism is wrong, and it’s certainly not science. For that reason alone, ideally it shouldn’t be taught as truth anywhere, let alone a science class. And it’s not just wrong, it’s spectacularly wrong. It’s the wrongiest wrong that ever wronged. We know the Earth is old, we know the Universe is even older, and we know evolution is true. Any one of these things is enough to show creationism is wrong. In fact, all of science shows creationism is wrong, because creationism goes against pretty much every founding principle of and every basic fact uncovered by science. If creationism were true, then essentially no modern invention would work. Since you’re reading this on a computer, that right there is proof enough. Mind you, things can be wrong and still scientific. It’s the nature of the scientific process that mistakes are made. The difference, though, is that in science we learn from those mistakes. We know that if some explanation we have for a phenomenon is wrong, there must be either more to the story (and our explanation modified), or a different explanation. Creationism isn’t like that. It’s wrong in almost every possible way, yet not one thing has been learned by its purveyors. * They cleave to it even more strongly the more you point out its colossal mistakes. In the case of this quiz, the promulgator is the truly awful group Answers in Genesis, which for years has been a font of nonsensical attacks on science and reality. It’s not surprising to me at all they would be behind all this. You can read your fill of their shenanigans at the No Answers in Genesis website. The thing that gets me is not the issue of legality here, nor necessarily who is promoting it. What really makes my heart sink is the reality that this is actually being taught to young children. Kids are natural scientists; they want to see and explore and categorize and ask “why?” until they understand everything. And we, as adults, as caretakers, have a solemn responsibility to nurture that impulse and to answer them in as honest a way as possible, encouraging them to seek more answers—and more questions—themselves. That’s how we learn. But this? This isn’t learning. It’s indoctrination. It’s the exact opposite of inquisitiveness: it’s children being told what the creationists want the answer to be, despite the evidence. And it’s not just that these children are being told something that’s wrong; it’s that they are also told to simply accept it and deny the actual evidence they come across. Dinosaurs existed long before humans? Forget it. People evolved to eat meat and plants? Forget it. Science? Math? Reality? Science isn’t like that at all. It’s a method, and it’s all about curiosity, exploring, seeing what else you can find to support or falsify your ideas, seeking answers and testing them. It’s about growing intellectually. Richard Feynman said it best: It’s a way of making sure we aren’t fooling ourselves. This quiz is the exact, precise opposite of that. I am deeply saddened that there are places teaching this to children. There is still hope for those kids; at some point they’ll get out into the real world and hopefully won’t have their curiosity and passion crushed by what they’ve been taught. Perhaps they’ll discover what science and reality really are. It happens; I’ve met many people who have been able to do this. But there’s a selection bias here; those people sought me out, people who have emailed me or whom I’ve met at scientific and skeptical conferences. I can’t really know what percentage of people raised creationists eventually had the scales fall form their eyes. That is the true tragedy here. The idea of denying a child a window into the real Universe is anathema to me. But it’s routine for Answers in Genesis, and whatever “science” teacher gave those children that quiz. At Snopes.com, the parent of the child who took this quiz said the Blue Ridge Christian Academy was otherwise a good school, but they will keep a close eye on the science, and at the end of the year will pull their daughter out of enrollment. Good on them. And for the rest of us, let that be the lesson learned here: watch over science education very, very closely. Despite the claims, creationism is not a sound tenet of Christianity, and shouldn’t be taught as one. It’s bad science, and bad religion. * To be honest, I’ll admit that creationists have learned one thing: If they want to fool people into getting it taught in the classrooms in public schools, they have to disguise it. First it was “creation science”, then it was “intelligent design”, and then it was using a “strengths and weaknesses” argument, all of which were clearly set up to be misleading. It’s an interesting interpretation of the Ninth Commandment on their part.